Kefir - The "Feel Good" Probiotic You Make Right at Home! Most of you must recognize the word "Kefir" from the milk/yogurt aisles in the supermarket.... But do you know what Kefir is? The word Kefir derives from the Turkish word keyif, which means "Feeling Good," and it's believed to originatel from the Caucasus Mountains. Its history is full of legends, and can be "traced" all the way to the Prophet Mohamed and mentioned by Marco Polo! It is also believed Kefir was used as a way to preserve milk by means of fermentation in the absence of refrigeration and pasteurization. Kefir grains were added to milk, generally in a goat skin leather bag, and hung by the door. Everyone who went by or through the door, shook the bag with their foot. After 24 hours, the fermented milk was poured, and fresh milk was added to the grains, keeping the fermentation process constant. But just what are the Milk Kefir Grains? 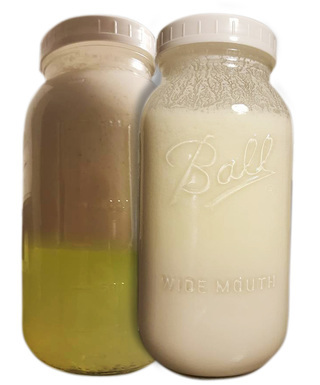 Kefir grains are microbially derived protein and polysaccharide matrices that contain cultures of bacteria and yeast that are essential to Kefir fermentation. The bacteria found in the grains depends on several factors, including the milk used during fermentation, the fermentation process itself, and even the region where the grains originate. Candida humilis, Candida Kefyr, Kazachstania unispora, Kazachstania exigua, Kluyveromyces siamensis, Kluyveromyces lactis, Kluyveromyces marxianus, Saccharomyces cerevisiae, Saccharomyces martiniae, Saccharomyces unisporus, Debaryomyces hansenii, Dekkera anomala, Torulaspora delbrueckii, Pichia fermentans, Saccharomyces turicensis, Issatchenkia orientalis and Debaryomyces occidentalis. Depending on what milk you use and on the quality of the Kefir grains, Kefir can contain anywhere from 1 billion to 10 billion CFU of bacterial/yeast probiotic per ml (cc). That is 5-50 billion CFU per TSP! It is important to note that Kefir grains, unlike the name suggests, are very much alive, and as such must be taken care of.... As any alive being, they must be fed - but what do they eat? That is the beauty of it: LACTOSE! In kefir, lactic acid bacteria are primarily responsible for the conversion of the lactose present in milk into lactic acid, which results in a pH decrease and milk preservation. Other kefir microbial constituents include lactose-fermenting yeasts that produce ethanol and CO2. Non-lactose fermenting yeast and acetic acid bacteria also participate in the process. After each fermentation "batch", the grains biomass increase in about 5-7%, which is why the bacterial/yeast composition varies according to the milk and process used for fermentation. Unlike the original days, the methods used to produce Kefir at home today differ in several ways. Of course no one is leaving a goat skin bag full of milk by the door to be pounded at, for one! Today Kefir is mostly made in glass jars, kept out of the sunlight to preserve the most amount of vitamins as possible. With that, comes one issue - The grains only feed what they can touch. While some will instruct to pour the milk over the grain in a jar, loosely cover it with a cheese cloth or a plastic lid, put the jar in the cabinet and forget about it for the next 24 hours, I beg it differ. By gently mixing the Kefir every so often you are making sure the grains are evenly distributed, therefore more lactose will be consumed, achieving a more thoroughly fermentation process. This is specially important for cats, which are mostly lactose intolerant. Another way of decreasing the amount of lactose is by doing what is called a "double fermentation" - you simply strain the Kefir after 24 hours into a clean jar, this time closing the lid, and place it into a dark cabinet for another 12-18 hours. The whey will completely separate from the curd, but a smooth texture can be achieved by using a blender. Not only Kefir is virtually lactose free, but studies show that Kefir can actually actually improve lactose digestion and tolerance overtime. Reduces the severity of Giardia , inhibits the adherence of Salmonella typhimurium and E. coli, 1, 2, 3. Kefir has shown a multitude of antibacterial and anti-fungal activities and has been tested in disk diffusion experiments against a wide range of pathogenic bacterial and fungal species, found to have antimicrobial activity equal to ampicillin, azithromycin, ceftriaxone, amoxicillin, and ketoconazole (Cevikbas et al., 1994; Yüksekdağ et al., 2004; Rodrigues et al., 2005; Huseini et al., 2012). Kefir also has anti-inflammatory and healing properties, and was effective in postoperative treatments and in patients with gastrointestinal disorders. ​Several studies have shown Kefir to have anti-carcinogenic effects 1, 2, 3, and can also act as an anti-oxidant. But one of the major ways probiotic products such as kefir are able to produce health benefits is through the modulation of the gastrointestinal immune system. Kefir has shown in studies anti-allergenic and anti-asthma properties, is capable of decreasing the levels of blood glucose, improving the symptoms of constipation, among many other health benefits. It's important to note that the quality of traditional kefir is mainly influenced by the microorganisms present in kefir grains and kefir processing conditions. Although scientists and food companies attempted to develop a commercial “kefir-type” beverage produced by different cultures and mesophilic and thermophilic lactic acid bacteria, or even pure cultures isolated from kefir grains, their success when compared to traditional kefir is limited. It is suggested that this limitation is due to the microbial diversity present in kefir grains and their interactions, which can determine the probiotic and therapeutic properties of final product, as well as peculiarities conferred by certain minority groups present in different grains. How do you acquire Kefir Grains? 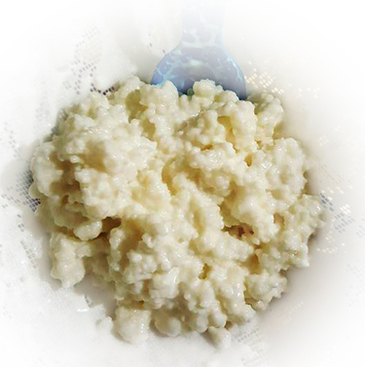 Kefir grains are passed on from friends or family, or can also be bought online in sites such as Amazon. Check with your local health food store, they may have a "kefir club," or be able to put you in touch with others making kefir. When consuming Kefir, you are drinking history! Think about it - you can't just create those grains out of nowhere.... They have been passed around from one person to another, until that they got to you! And the beauty of it? Every time someone used a different milk, a different processing method, temperature, etc - the microbioma in the grain has changed! You will notice that once you start making kefir on a regular basis, your grains will start multiplying exponentially - that's why they are passed around. What else can you do with them? You can also eat them - eating them is VERY healthy, and they are just about the most potent probiotic you can get your hands on! ​We cannot stress enough the need to start SLOWLY. And we mean VERY slowly. Kefir is a very potent probiotic, with many substances your pet has never consumed. Give one teaspoon to one tablespoon of kefir to small cats or small dogs per day. Large dogs – 2 – 3 tbsp. *** Cats especially*** Start with 1/8 tsp, and increase every FEW days by doubling the amount, up to one-half teaspoon. Give your cat only 1/2 of the dosage (one-half teaspoon) for at least one to two weeks before increasing to 3/4 and so on. 1- Do a double fermentation - still reacted? 2- Change the milk for goat milk - still reacted? I personally had a cat react to kefir, to both regular cow's milk and raw goat milk. I am giving him a break and will try a very slow introduction later on. My other cat seemed to react when I increased the kefir to 1/2 tsp per meal, however the problem was solved with a slower introduction, and a double fermentation. She is also ok with goat milk kefir. I have substituted my cats', mine and my dog's store bought probiotic for kefir, and everyone is doing terrific! Kefir has been the perfect addition to my pets' EZComplete diet - how would it not be with so many wonderful properties?